I have an unequivocal relationship with group-work; I stand with a foot in both camps. I recoil at being expected to ‘do it’, but get some of my most heightened delight at my students’ capacity for taking the ideas I’ve delivered in class into new and unexpected terrains. As I hover nearby listening to intelligent thrust and counter-thrust of debate of a topic I’m intrigued by, but didn’t know they would be too, there is a thrill that something important has been transposed. However, the ‘requirement’ to see students actively engaged in discussion to prove that effective learning is taking place has not washed over my career without it leaking into observations in my classroom over the past few years. Urged by an external observer, not too long ago, that the lesson would only have been improved if the students had been given the option to ‘discuss the information in groups’, my response – that they were receiving information about how headlands are eroded; there is no dispute in this, there is no ‘opinion’, there is nothing to ‘discuss’; it just ‘is’, and they need to learn it….. was met with a response of ‘…But even so, if they just had the chance to talk about it…’. I yielded as much as do the cliffs at Flamborough. I am not an advocate of the ‘all group work is dubious self-delusion’ but I have seen it mis-used, its use mis-judged and functionally abused in various contexts – including with adults. It is one of the essential techniques in the armoury that can be satisfyingly effective but that needs deploying with judicious thought for context, material, desired outcome and capacity of the students who are to interact. My A level students couldn’t fulfil the demands of the course if they weren’t developed in the art of dialectic and rhetoric (thank you Martin Robinson – I was aware we were doing that, but didnt’ know the terms or antecedents until your Trivium 21C) but I’ve also seen Year 7s and 8s surprise with the explosion of ideas they have conveyed, that I wouldn’t have witnessed had we relied on Q&A and what they write in their books. Having said that, I’ve had more than my share of frustration at group tasks that degenerate into gossip, detached relaxation, and the delegation of responsibility for doing anything productive to ‘the geek in the group’. In one of his posts on Group Work David Didau quotes : “Dylan Wiliam says that effective group work requires two ingredients: collaborative goals and individual accountability. If we have one without the other, then the group work will not be effective. Teachers are generally good at creating group work where the first condition is met but less good in ensuring accountability.” I posted on the accountability grid I use with groups here to try to overcome the one constraint. But the other – the collaborative goals? I think this is because sometimes we’re unsure ourselves about the why and the how of the group work options we have available. Increasingly I find that when grappling with the knotted filaments of learning contexts and teaching options I go to SOLO taxonomy to offer a template of organisational logic. 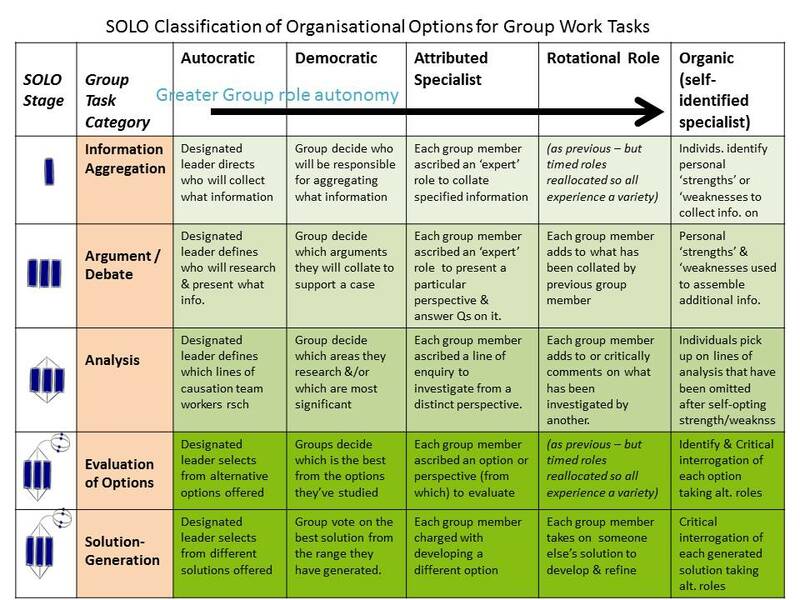 Considering the why, when and how of group work tasks, they do fall into a classification that I think is a useful tool from which to select. It also assists in determining what is appropriate at which stage of each unit. Early on students are accumulating information, organising it, classifying it, and – really important when using SOLO – enriching it to levels of sophistication so that later stages of deeper thinking have effective content that is robust enough to do intellectually rigorous things with. 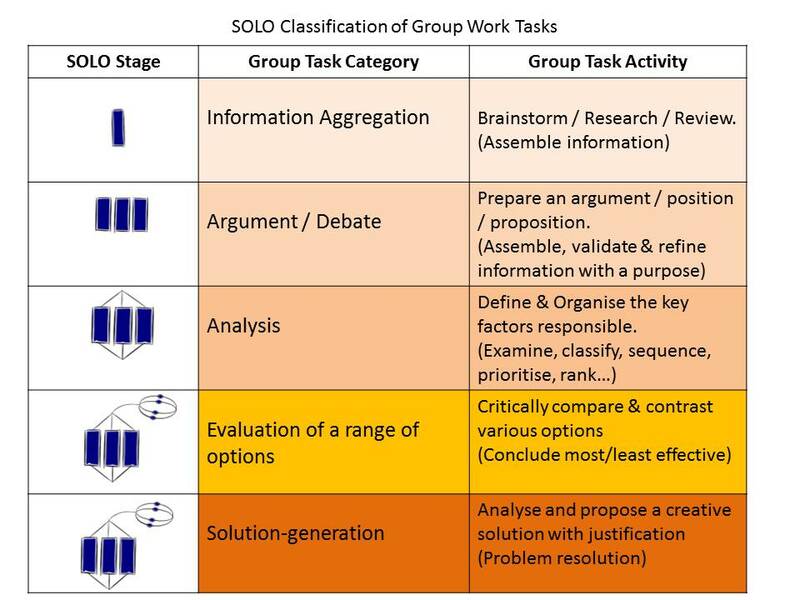 The classification can be a one-stop-shop of group tasks using a single line of the grid, or a sequential process over an extended period which builds through all of them. For example, early in a Year 7 unit students have to debate whether a new wind farm should be located in a nearby village. The group task is the ‘Argument/Debate’ category and the guidance is about accumulating the widest breadth of information at the greatest depth of validity and exemplification to be able to argue on one side or the other. Whereas with the Y13s who are investigating the best way for Sheffield to reurbanise a series of group tasks will build up to the final ‘solution-generating’ discussion, via the full sequence over a period of lessons. So what types of team operational styles exist? I have a fairly jaundiced view of employers’ call for more recruits to demonstrate greater ‘team work skills’ because I suspect many use the term as a cover-all for a huge range of employer needs. For some I can’t help but think that ‘team work’ involves – ‘come in on time, do the job without question, and don’t cause me problems – that’s how I expect my team to operate’… whereas in other employment situations ‘team work’ will embody as much ‘initiative’ as the former requires ‘follow my instructions to the letter’;… ‘display originality’ as ‘stick to the rules’. 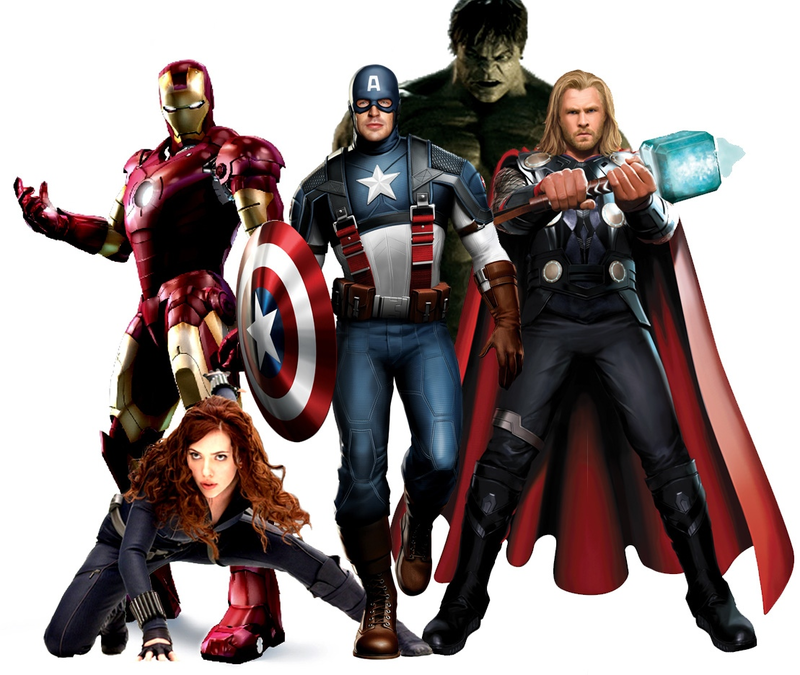 So – I think we can be a little more subtle here and explore different styles of team working to select-for-purpose. It will depend on the maturity of the group, the abilities of the individuals, and the outcome we want. But I like students to experience a range of team-management styles from the Autocratic ‘dictator’ group, the group that decides for itself who their ‘manager’ is – or even if they’ll have one, the teacher-ascribed-roles group through to the one that requires most maturity and self-knowledge – the Organic group that identifies and agrees their particular strengths between themselves. (The ultimate of this is when I can convince my sixth-formers to take, for their specialist area of ‘expertise’ an area they know they are ‘weak’ on to develop that aspect – they’re really running on high-octane self-knowledge and goal-orientation if they can opt for that one on a regular basis). Year 13 have to be able to ‘examine the role and perspective of decision-makers’ – always a trickier one. But we explore this as they group-debate the best site for an out-of-town retail development given 5 possible locations on an OS map. They are ascribed a role to construct, then argue a preferred choice, but then have to swap role and record how their perspective changes of each location looking through the eyes of a different interest-group (Classification: Evaluation of Options / Rotational Role). This classification is a work in progress – an attempt to make better judgements as to when and how to use a group context and to fit the style to the learning purpose better. Zoe puts this very effectively as her #7 advice statement: “Plan groupings according to learning purpose. Learners are often asked to work in groups that are not concerned with the purpose or intended learning outcome. Effective group work is underpinned by deliberate planning of group formation.” To which I’d add – and a considered reflection on the team work style that will best challenge students and provoke a richer response.